This entry was posted in holster, pistol, self-defense and tagged dragon, Glock, leather. Bookmark the permalink. That wouldn’t take a G17L or a G34, though, correct? 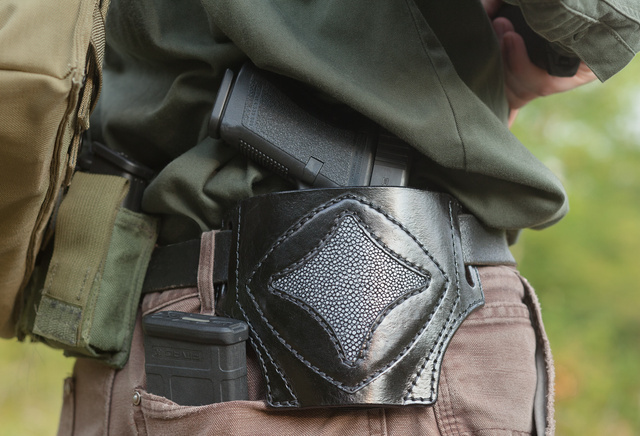 I have not tried with that particular holster — but you could simply order one long enough for a G17 or G34. Talk to Dennis. OK…you site is blocked by WebSense at work, so I tried posting a response via my BlackBerry. In case it didn’t go thru, here is the response, if you would be so kind as to post it for me? Dennis from Dragon Leatherworks here. I’m not sure what the difference is between the 17 and the 17L, but I can fit both the 17 and the 34 to a FlatJack. The FJ is NOT a dual-use, ie: it can’t holster both the 17 and 34, but if its the same frame group (the 17/22/31) it will function and retain properly for that group. I use BlueGuns (www.blueguns.com) almost exclusively for my holster models, so if you don’t see a particular gun listed on my site, check on Blueguns, then drop me a line on how to proceed with a purchase. I’m always adding more models, and am currently putting a list together for my next round of models to get from Blueguns. Drop me an e-mail if you’re seriously interested in the 34 for a FlatJack, and I’ll get it in stock and let you know when you can order one.